The scene: Pile of clean towels on the bannister at the bottom of the stairs. They’ve just toppled over. Now lying at the bottom of the stairs. I’m on my way down. Son is about to come up. Me: Oi! Don’t you dare just step over those towels. Me: I mean don’t even think about stepping OVER the towels. Son (totally confused) … stands both feet carefully ON the towels. Note to self: Aspergers: very literal. Pedantic. Little understanding of nuances. I think I nearly pee’d I laughed so much. I should’ve known better. Bless him. Fabulous. It’s out. It’s ready and it’s waiting for you. For just £2.99 a complete 7-day ready-made, balanced, fabulously varied weight loss plan can be in your inbox. Then all you have to do is stick to it. IT’S JUST SEVEN DAYS. How hard can it be? I have to say I am THRILLED with this plan – with the layout, the options and most of all the results. The plan caters for all ‘weights’ so you choose one of three calorie ranges and the rest is laid out for you. The shopping lists are done, the recipes are there, the pictures are colourful and reflect exactly what the meals look like (even when I cook them – which is a first!). Success, however, lies very much in the planning side of this programme. No ready meals on this menu. Everything is fresh and I warn you that for the first week it seems like a LOT of work (so plan your days and get the basics all done early!). We all agreed, however, that somehow by the time we got to a second week everything already seemed so much easier – perhaps because we were now familiar with the main recipes? If I was to give you a few tips – I would say, firstly, to plan at least 3 days in advance and check out any lunches that require cooking and prepare those the evening before (when making dinner) or while you’re making breakfast. This cuts out cooking in the middle of the day. The other thing I would say would be to bake both sets of protein bars and make up a few jellies right at the beginning of the week, so that’s all done and dusted, too. After that, it’s a breeze! Yes, there’s room for options but really not many. You want this to work, then do what it says. You start playing around with options, you’re messing with the balance, with the calorie counts and you may well be disappointed at the end of the week. Logical, right? Of course, if you have any major issues, then let me know. We can always come up with an alternative somehow that’s going to work for YOU. That’s it, really. Do email me with any questions at [email protected] OR find the YCF 7 Day Meal Plan page on Facebook – specifically set up for this plan and everything related to it. If you are interested in buying it, please email me or find me on Facebook. 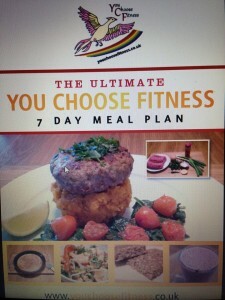 Payment can be via Paypal or directly into the You Choose Fitness business account. Are you ready to get your weight loss journey off to a fantastic start …. OR to leap right off that weight loss plateau?